Opa’s Believe It or Not! Here’s how it happened. I was working in the barn with Alyssa’s dad (Opa to our kids). We were installing some new water bowls in our lambing jugs. Lambing was already busy, and as new lambs were born we would put away the ewe with her new lambs in a jug. Towards the end of the day Opa was working near one of the lambing pens where one ewe had a nice little set of triplets. He brought her out of the pen, down the alley and into her 4×4 jug. We checked her milk, marked her down on the chart and, after finishing up our work, headed in for the night. Later that night, I came back to check ewes. From some distance away I could see the ewe with triplets. It looked like there were more than three lambs in her pen. It’s not unusual for a ewe to drop another lamb after a delay of a couple hours if she gets interrupted in the process. So, I went to check her. The closer I got the more lambs I saw. Four, five, six! Nope SEVEN! I couldn’t believe it! Seven healthy active lambs. A new record for us! We have seen six in the past, but they are rarely strong and healthy. These lambs were certainly below our normal birth weight but, considering that she had about 3 times as many lambs as our average ewe, the lambs looked amazing. She had them all up and drinking and she wasn’t rejecting any of them. The interesting thing is that if she had lambed out in the group pen I would have assumed that she was stealing some lambs from another ewe, but since she had the last 4 of them in an individual pen I knew they had to be hers. I put her out into a makeshift pen in the alley so that she would have enough room for all her lambs. 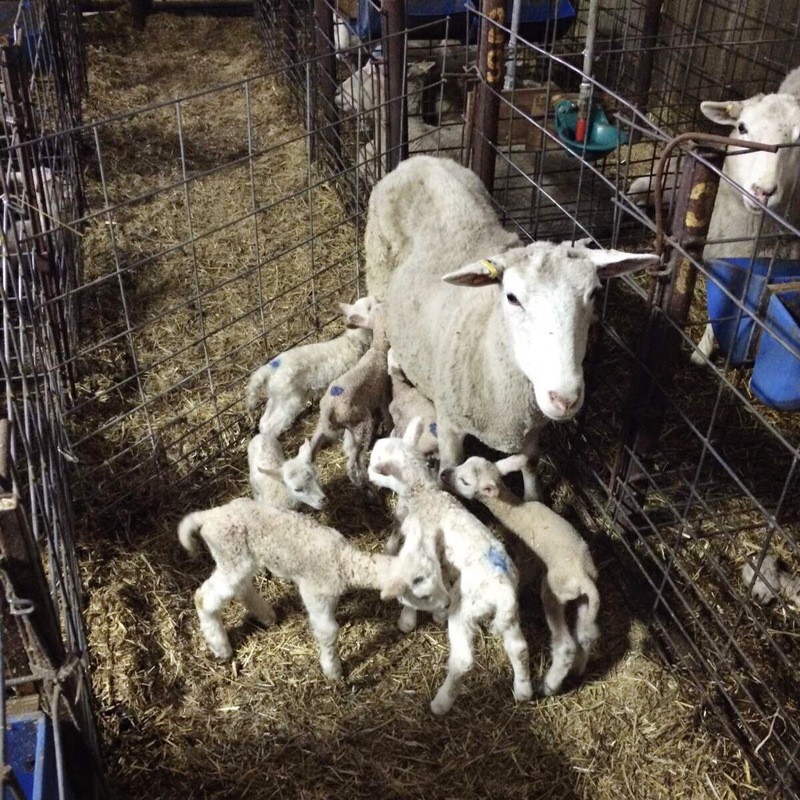 In keeping with our protocol for large sets of multiples I fed colostrum to all the lambs to ease the competition pressure among the lambs and to make sure that all of them received adequate antibodies. In this case I had to put a blue spot on the lambs as I fed them to make sure that I didn’t miss one. The next morning she was still beautifully mothering all her lambs and everybody came out to have a look. What an exciting event. It made me think that if every ewe could manage this many lambs so well it would be great to have seven all the time, but it’s probably better if this is just an occasional surprise.